Being that I am still recovering from the flu and not able to get out and go full out on a training workout, the triathlete’s heart in me is broken. I have never gone this long without punishing my body in some way. My body knows it too, the muscles are restless, the brain is starting to feel depressed, and the cabin fever is making me wish I bought a condo at the beach. So, while I was sick in bed, miserably thinking about the torturous training that I enjoy so much, I had to do something. At this point, the inner artist in me spoke up and reminded me of that sketch pad and pencils that my grandmother gave me a while back. “Hhmmm…. 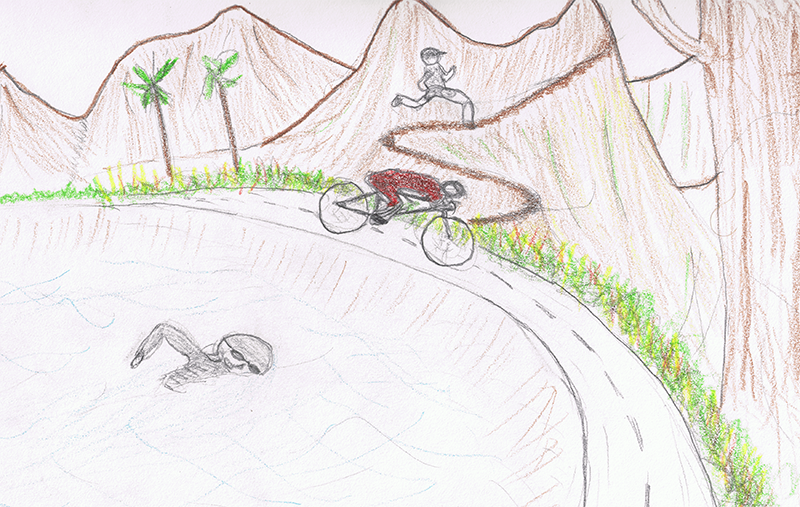 this could be the best thing since the Mona Lisa,” I thought as I turned to a clean page and started thinking about my ideal swim, bike and run. It wasn’t long before I had the sketch roughed out below. While it may not be the Mona Lisa, for this bed ridden triathlete, it was the best thing since cold medicine. Swimming in a slightly rough water in a cove, biking along the waterfront of a tropical island with water on the right, high mountain peaks on the left, and finally finishing my fantasy event with a trail run, up, up and up to the top of those peaks so that one can relish in their accomplishment. The wonderful world of triathlon is alive and well in this triathlete. I may be bed ridden and miserable, but my mind is full of the adventures yet to come! This entry was posted in barefoot running, Commentary, Cycling, FiveFingers, Goals, inspiration, Recovery, Running, Swimming, triathlon training and tagged Commentary, Triathlon, triathlon training, Workout_Logs. Bookmark the permalink.